EPA Administrator Gina McCarthy joined Mayor Julian Castro and executives from CPS Energy and the San Antonio Water System Wednesday for a tour of SAWS’ Dos Rios Water Recycling Center. McCarthy was here to highlight San Antonio’s innovative leadership in sustainability, water conservation and clean energy in the face of a changing climate. City-owned CPS Energy and SAWS combined forces at Dos Rios, creating a model for how utilities can work together to mitigate the impacts of climate change. SAWS processes treated and recycled wastewater there, sending some of the clean water into the Medina and San Antonio rivers and delivering the rest to golf courses, parks, and commercial and industrial customers throughout the city. In 2012, Dos Rios became home to the 200 acre, 20 MW Sinkin Centennial Solar Farms, which delivers energy to CPS Energy. 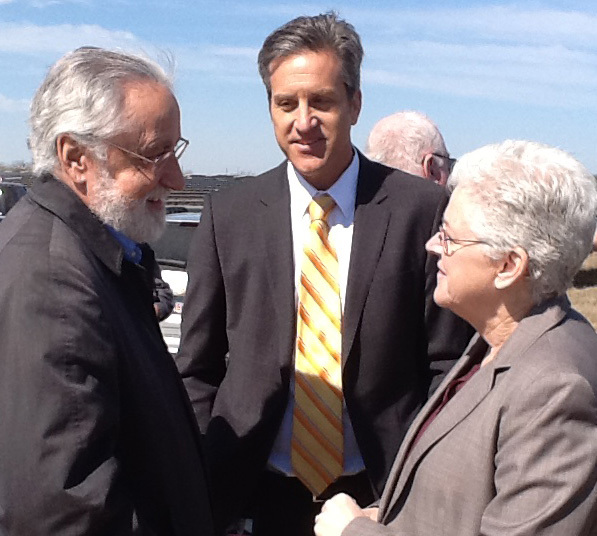 Solar San Antonio’s Lanny Sinkin, CPS Energy’s Cris Eugster and EPA chief Gina McCarthy discuss water\solar project. The solar farms were named in honor of Sinkin’s father and SSA founder Bill Sinkin, who passed away recently at age 100. The Sinkin Centennial farms are a partnership between CPS Energy and California-based SunEdison. They’re expected to offset more than one billion pounds of carbon dioxide over 25 years — the equivalent of removing more than 100,000 cars from the road for one year. The partnership with SunEdison is part of CPS Energy’s New Energy Economy initiative, which attracts business partners that drive job growth, improve the environment and invest in education.